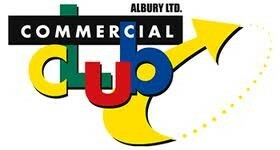 The Commercial Club (Albury) Ltd was founded in 1903 as a Business Man's Club with an emphasis on Commercial Travellers. The Club is now a large Social Club with 30,000 Members and provides quality Restaurants, Bars, Lounges, Entertainment and Sporting Activities - Golf Club and Course, Bowls, Squash, Gymnasium, Snooker, Swimming, Fishing and Bridge. The Sporting Sections of the Club have 3,000 Members. The Commercial Club is located in Dean Street Albury in the centre of the cities CBD. The Club's Membership Base covers a 100 kilometre radius from Albury including the Victorian City of Wodonga. Albury/Wodonga has always been regarded as one of the fastest growing inland centres of Australia.Albury is the Centre of a highly successful Tourism district surrounded by farming communities. A range of facilities and services are offered by the Club to Members and Visitors and include Keno and two TAB's, Restaurant - Silver Service Dining, Seven's Bistro, Reflections Cafè, Golf Bistro, and The Courtyard Dean Street, Bars - six bars and lounges, Entertainment - 5 Days per week, Conference Facilities - 10 Rooms for 10 - 500 people, Bottle Sales Area, Sporting facilities.